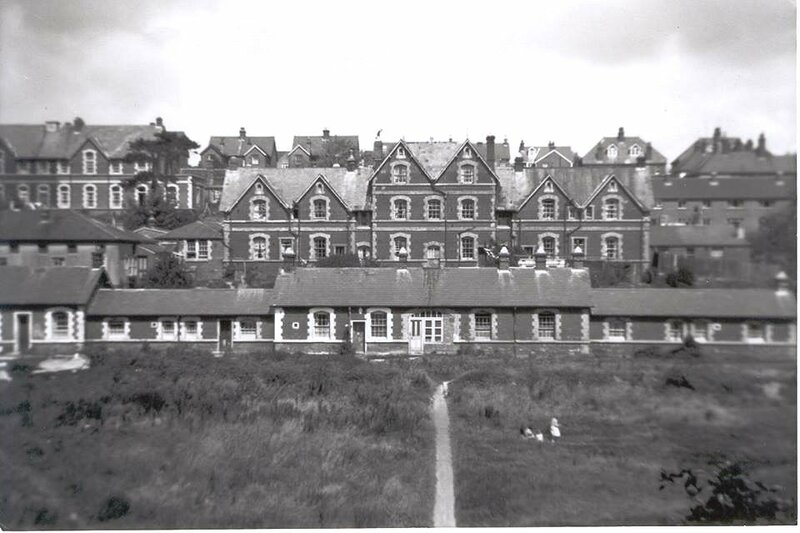 Mat Homewood will tell the story of the impressive (and foreboding) Lewes Union Workhouse building, which once stood by De Montfort Road. Full of fascinating stories, photographs and plans, this talk takes us from the building’s construction in the 1860s, right up its gradual demolition during the 1950s to make way for the Abergavenny Flats. Mat will look at life in the workhouse during the 34 years it was used in that role. He will also delve into the often turbulent lives of the seven workhouse masters, which included heavy drinking, immoral behaviour and insanity. The talk will then cover the building’s brief history as the home of the Female Inebriates’ Reformatory, including the various escape attempts of some of the inmates. Mat will go on to discuss the building’s conversion to private flats in the 1920s, and its reputation by the 1950s as the ‘black spot of Lewes’. The talk will finish with a look at the plans made to replace the old workhouse with the collection of flats we see there today. This well-illustrated talk provides a fascinating insight into this significant, but now largely forgotten Lewes building. If there was smuggling to be done, Sussex men have generally been willing to play their part. In the early 17th century, when the Wealden iron industry was at its peak, cannon made in the Weald were liable to be exported illegally via the Sussex ports to England’s enemies abroad. One reputed participant in this trade was Stephen Aynscombe of Mayfield, a prosperous and well-connected iron-master who ran Pounsley Furnace in Framfield parish. In 1620 he was accused of conspiring with the Spanish Ambassador, one of the most influential men in King James’s court, to smuggle 100 guns to Portugal from Lewes, via a ship called ‘The Pearl’, captained by Lucas Weston. He somehow had a genuine-looking warrant for this trade, stamped with the privy seal, which was discovered in Lewes when it should have been kept safely in the Treasury in London. With the panic over, in July 1621 Stephen Aynscombe was pardoned by King James in the Privy Council. By that time his furnace had been destroyed and his guns seized. They had found 3 falcons, 22 minions, 28 sakers and 16 demi-culverins at Pounsley, but only 4 demi-culverins, 5 sakers and 1 minion in Lewes. The demi-culverins were larger cannon than the sakers, with the minions and falcons smaller and lighter. By 1622 he was back in business. He even got his guns back, and this time he sold them on Tower Hill. The list of 61 licensed inns and public houses in 1887, 57 of which survived until 1902 probably represents their highpoint in Lewes. Many earlier lists omit the smaller alehouses, or at least do not include their names, while as the 20th century advanced, the numbers fell quite sharply. Inns that still exist today are asterisked. The landlords are named where known – in 90% of cases a different landlord was in charge 15 years later, suggesting a quite rapid turnover. NB: The Rifleman is now the Pewter Pot, and the Rainbow is now the Rights of Man. The majority of ship owners in Victorian Lewes were merchants whose businesses required access to marine transport. The various coal, timber and lime merchants would derive a commercial advantage from priority access to the means of transporting the goods in which they dealt, while the ironfounder Ebenezer Morris needed both to import his raw materials and export his finished products. However, a family who stand out amongst the other Lewes ship owners are the Tanner family of Cliffe, who combined this business with clock and watch making. The first of the family to come to Lewes was William Tanner (1799-1873). He came from a large family who lived in Horsebridge, near Hailsham, which was in Hellingly parish. His brothers followed such occupations as draper, tailor and wheelwright, but the teenage William was sent to Gibraltar, where he trained as a watchmaker initially with Mr Johnston, watchmaker, and later with Messrs Johnston & Bruciano, merchants. A series of family letters sent to him there survive [ESRO Acc.10432]. By 1821 he had returned to Hailsham, where he set up as a watchmaker, but he moved to Lewes by 1834. William Tanner of Hailsham was one of the subscribers to Thomas Walker Horsfield’s ‘History and Antiquities of Lewes’ when it was published in 1824. His eldest son Stephen was born in Hailsham c.1831, but he had children baptised at Lewes All Saints in 1834 & 1836, before moving to Cliffe by 1839. His household was at 20 Cliffe High Street in the 1841 census and at 17 Cliffe High Street in 1851, but in 1855 he took a long lease of 50a Cliffe High Street from Jonathan May, proprietor of the eating house at 50 Cliffe High Street that in 1861 became the Lewes Castle public house. William Tanner is called a watchmaker while at Gibraltar, and when at Hailsham in 1833. He is a Lewes watchmaker when standing surety in 1834; a Cliffe watchmaker when administering estates in 1839 and 1840, and also in the 1841 census. He was a Lewes merchant when administering another estate in 1846 and a Lewes silversmith when engaged in the sale of a family property in Horsebridge in 1848. He was called a clockmaker in the 1851 census, and a watch and clock maker when taking the 1855 lease. He was a Lewes watchmaker when helping administer the estate of his father-in-law, a Hailsham solicitor, also in 1855. He is a watch and clock maker again in the 1861 census, but by 1871 he was a ship owner and watch maker. By this date his sons Stephen and William Henry were in residence at 50a Cliffe High Street, and William Tanner and his second wife had moved to St John-sub-Castro parish. His funeral was held at St Thomas, Cliffe, in 1873. William’s three sons Stephen Tanner (1831-1912), William Henry Tanner (1834-1905) and Alfred Edward Tanner (1841->1911) trained in different areas. Stephen was apprenticed to his father as a clockmaker in the 1851 census, lived with his father as a watch and clockmaker in 1861, and was described as a watchmaker and ship owner in 1871. In 1881, still at 50a Cliffe High Street, he was a watch and clock maker employing 3 men and 3 boys, and by 1901 a watch maker and jeweller. Soon afterwards he retired to Seaford, where in 1911 he was a retired watchmaker and dealer. He handed over the family business to his eldest son, Stanley Edward Tanner, who in 1911 was a watchmaker, jeweller and dealer in Cliffe High Street. His two younger sons both enlisted as officers the Great War. His youngest son Raymond Stuart Tanner, who in 1901 had been a watchmaker and jeweller assisting his father, was killed in action near Ypres on 30 August 1916. His name appears on the Lewes War Memorial. William Tanner’s second son William Henry Tanner was an apprentice cabinet maker when living with his clockmaker father in 1851 – presumably his role was to make the cases for the family clocks. In the 1871 census he was living with his brother at 50a Cliffe High Street, but his occupation was simply ship owner. He was also described as a shipowner in 1881 (when he lived in Kensington) and in 1891 (when he was in Hailsham) but in 1901, still in Hailsham, he was a retired jeweller. At the administration of his estate in 1905 he was called a Hailsham ship owner. He must be the William Tanner, watchmaker of Cliffe, who carried out extensive and expensive repairs to the Cliffe Church clock in 1886. The third son, Alfred Edward Tanner, was apprenticed to a Cliffe High Street chemist, Thomas Figg, and spent a long career as a pharmaceutical chemist away from Lewes – he is recorded in Liverpool, Hornsey and Tottenham, while his wife was from Falmouth in Cornwall. While never giving any other occupation than chemist, he too had an interest in the shipping business. The Lewes-based ship owners of Newhaven-registered sailing ships in 1872 included Stephen Tanner of Lewes, watchmaker, who was the managing agent for the ‘Olato’ (188 tons) and the ‘Zenobia’ (190 tons) while William H. Tanner of Lewes, shipowner, was responsible for the ‘Merchant’ (232 tons). Ships of this size would have a crew of about 8 men. The ‘Olato’ had been built in Prince Edward Island, Canada, in September 1863, but was registered in Newhaven in February 1864 by Jonathan May of Lewes licensed victualler (who held 43 of the 64 shares) and William Tanner senior of Lewes, shipowner (who held the remaining 21 shares). They financed the purchase with a mortgage of £1,150. After Jonathan May died in 1868 his share was held by his executors (Stephen Tanner, watchmaker, and Edward Hillman, solicitor), while William Tanner’s share passed at his 1873 death to Stephen Tanner, watchmaker, and William Henry Tanner, shipowner. William Henry Tanner was appointed managing owner in 1875. The ‘Zenobia’ was a much older ship, built in Dundee in 1847, but registered at Newhaven in February 1867 by Jonathan May and William Tanner of Lewes, with 32 shares each. William Tanner senior sold half of his shares to his son Stephen Tanner of 50a Cliffe High Street a few months later. The remaining shares passed as above to their executors on their deaths. By 1877 William Henry Tanner held 32 shares, Stephen Tanner 16, and Stephen Tanner & Edward Hillman the remaining 16. Again, William Henry Tanner of Cliffe was appointed the managing agent in 1875. The three Tanner brothers held a controlling interest in the ‘Merchant’ too. Stephen Tanner held 22 shares, William Henry Tanner 14 and Alfred Edward Tanner 7. The remaining shares were held by a Newhaven merchant. Sadly their Newhaven shipping ventures ended in a series of disasters. First to go was the ‘Merchant’, which foundered off the Kent coast on 12 April 1879. Then in January 1881 the elderly ‘Zenobia’ was condemned, and had to be broken up. Finally the ‘Olato’ had to put into the port of Cuxhaven, near the mouth of the Elbe, for repairs while on its way back to Newhaven. It sailed out on 2 March 1883, and was spotted once at sea on the following day, but was never heard of again – it was listed as lost with all hands. The instigator of these shipping ventures in which the Tanner family were involved seems to have been the eating house keeper and later publican Jonathan May. His Cliffe High Street Inn was named the Lewes Castle after a ship of that name, built in Lewes in 1839. The Gibraltar experiences of William Tanner senior may have predisposed him to see mercantile trade as a profitable activity worth investing in. However, a number of the clocks and watches made by the Tanner family in Lewes still survive, and command good prices when they come to market. These have perhaps proved their more lasting memorial. 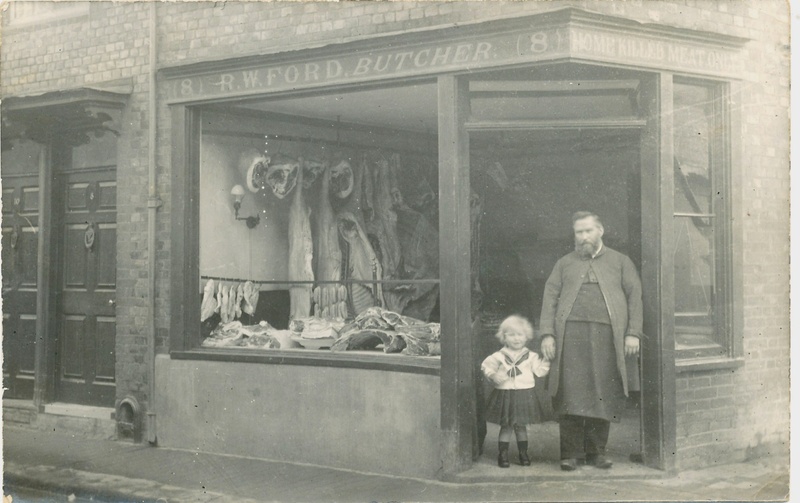 This Edwardian photograph of butcher Robert Ford outside his shop at 8 South Street, Cliffe, was originally posted on the Lewes Past website. The small boy holding his hand in the shop entrance is my grandfather. The shop sign notes that he sold only home-killed meat. Another photograph taken on the same occasion shows a ‘Rusbridges Cottages’ road sign high on the side wall of the shop. The 21 June 1762 Sussex Weekly Advertiser noted the following items as for sale by Joseph Molineux, ironmonger, Lewes. SCYTHES much better and cheaper than any sold elsewhere. BAR IRON of all sorts. A Quantity of Herefordshire CYDER, old in bottles, strong and racy, Rich PERRY. VINEGAR, from decay’d cyder, not inferior to what’s called wine. This entry was posted in Biographical Literature, Ecclesiastical History, Economic History, Family History, Lewes, Local History, Maritime & Naval History, Military History, Social History. Bookmark the permalink.